Ridgeline plots are partially overlapping line plots that create the impression of a mountain range. They can be quite useful for visualizing changes in distributions over time or space. These types of plots have also been called "joyplots", in reference to the iconic cover art for Joy Division's album Unknown Pleasures. However, given the unfortunate origin of the name Joy Division, the term "joyplot" is now discouraged. The alpha aesthetic is now by default applied to jittered points. If you don't want this to happen, set point_alpha = 1. Allow custom function to calculate the position of quantile lines. This makes it possible, for example, to place a line at the mean, via quantile_fun = mean. Allow coloring of quantile lines and jittered points by quantile. Expanded documentation and gallery of example plots. Reworked stat_density_ridges, geom_ridgeline, geom_density_ridges, etc. so that jittered points and quantile lines can be drawn on top of the distributions. 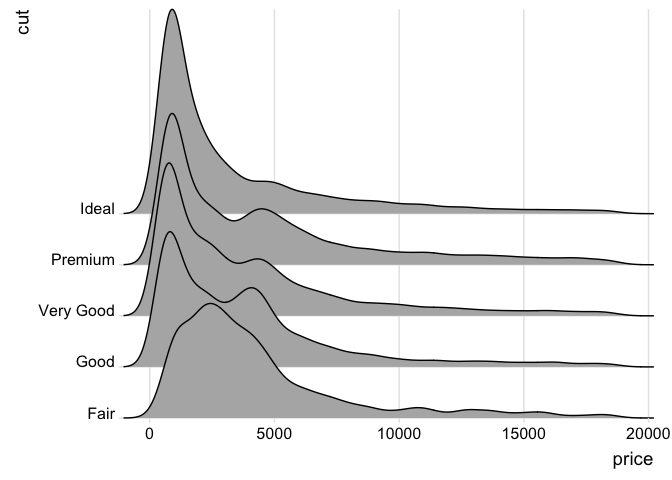 Points and quantile lines can be styled separately from the rest of the ridgeline plot, via special aesthetics. Added position options to control how the jittered points are drawn. Default is uniformly spaced within the density area. Added geom_density_line() which is a drop-in replacement for geom_density() but draws a ridgeline rather than a closed polygon. theme_ridges() has been modified so that font sizes match the cowplot themes. In particular, this means smaller axis tick labels. Added an option to center axis labels to theme_joy(). Added cyclical scales that make it easy to alternate between fill colors and other aesthetics. New stat binline that can be used to draw histogram joyplots. Various improvements in stat_joy. In particular, it now works properly with multiple panels. It also now has parameters from and to to limit the range of density estimation, just like density(). New geoms geom_ridgeline_gradient and geom_joy_gradient that can handle gradient fills.